This only gets sillier an sillier. This is supposedly a real timelapse video from the International Space Station. Those solar panels keep spinning around - as if the sun's position would change more than our little planet Earth! 1: We see NO change in lighting - in the sky(edit)- whatsoever. Why would the solar panels have to rotate? To catch more sunlight ??? 2: The Earth surface stays totally level with the ISS all along the timelapse - as if the International Space Station never wobbles by a whisker in relation to our planet! Let me just express my opinion: this is just grotesquely silly. NASA - and ESA - are fooling with our minds. But, of course, the imagery they give us from inside the International Space Station MUST BE REAL, right? Good Heavens. Can anyone honestly lend an ounce of credence to this crap? simonshack wrote: 1: We see NO change in lighting - whatsoever. Why would the solar panels have to rotate? To catch more sunlight ??? 1. I wouldn't say no change in lighting... judging by the moving shadows, the light source is showed as shifting and the solar panels represented as to follow that, which isn't entirely illogic. Side question... Has anyone ever seen an ISS video from inside the station with a window in the back looking out to earth or space? According to this article from NASA http://science.nasa.gov/science-news/sc ... un_cupola/ since 2010 they have "a dome for observing space and the earth". Why never the simple a idea of making a video standing in front of it? I guess something astronaut related that happened in January overshadowed the view. Thanks for the links! Oh my. "Window on the world"? That's a priceless 9/11 reminder! 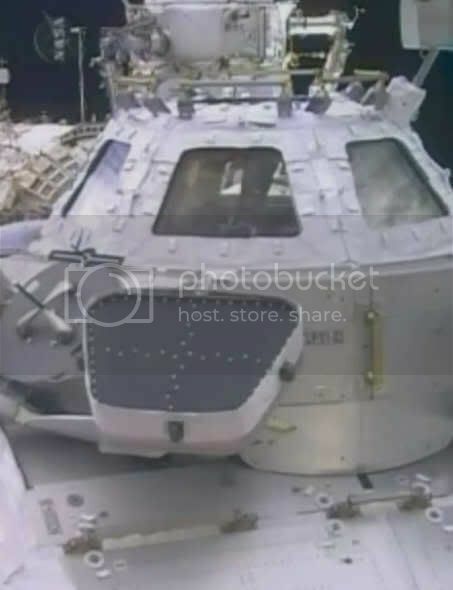 Once again, this seem to contradict the "spinning" of the ISS as declared by other actornauts, since if the ISS spins, then the dome is alternatively a "window on the world" as much as a "window to outer space". But of course we are never showed and we will never be showed outer space with all its boring billions of stars and galaxies. Also, these of course are all pre-recorded videos. What I would like to see is a *live* video from the ISS, with the earth going by in the background as the actornauts are connected with someone on the earth in real time. I suspect they don't dare to do this because they could be exposed for: 1) incorrect position of the ISS relative to the background 2) incorrect weather represented on the "earth" passing by. I find it also an indicator of fakery the fact that in the second video twin scott kelly talks about the person holding the camera as "my cameraman". This TV expression makes no sense on board the ISS, where there are no cameramen but only other fellow scientists and astronauts. It would be perfectly impolite if not outrageous to define one colleague of yours, whose job is as important as yours scientifically and technologically, as "my cameraman". I think you would say something like "John, here, filming me". It's not the Enterprise: there can be what, ten people overall at any given time, and you call one of them "my cameraman"? Preposterous. Indicator of the fact that it was all filmed in a studio and there actually was "his cameraman" there. nonhocapito wrote: 1. I wouldn't say no change in lighting... judging by the moving shadows, the light source is shifting from left to right, no? Isn't it logic if solar panels follow that? 2. Well maybe it is part of what makes an object stay in orbit the fact that it won't wobble. After all, in void, what kind of turbulence should make it wobble? Hehe - I like you, nonho! You always keep me 'on the edge' - which is a good thing, I might trip over it and tumble into the void! 1- I meant of course "sky lighting". Yes, I do see the (spot)light fluctuating on the spaced-craft itself. All sorts of things can be viewed through those space windows! And what kind of wig is that astronaught woman wearing? simonshack wrote: Hehe - I like you, nonho! You always keep me 'on the edge' - which is a good thing, I might trip over it and tumble into the void! Sorry Simon sometimes I should probably hold my tongue and wait to understand better what is being meant. For some reason we are always rushed. Anyway I then perfectly agree with your second point: does the ISS spin or not? The imagery and the storytelling are absolutely contradictory. As to the dome, unless I am missing something the "UFO" you see moving is just the hatch covering the windows. Every window has one and the way I understand it they are normally closed, I guess because of the famous debris that always misses. nonhocapito wrote: Every window has one and the way I understand it they are normally closed, I guess because of the famous debris that always misses. 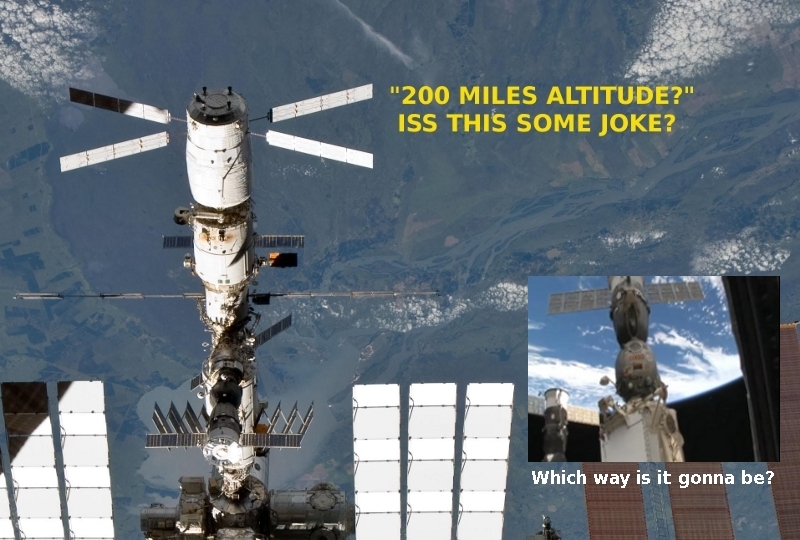 And why - oh why - does no one tackle the altitude issue of the ISS? Why the silence? simonshack wrote: Why the silence? Like a told you, often silence can be agreement. Anyway, if I really had to pick on that argument, I could say that maybe the picture where the ISS looks closer to the surface of the earth could be explained with using some sort of telephoto lens from far enough? Like those postcards where the moon looks unrealistically big hovering over a city or something? Photographers look for these effects all the time, so it is no surprise if they are featured in NASA products of propaganda. ...could be explained with using some sort of telephoto lens from far enough? No. Telephoto lenses have very limited depth of field. Photographers use it for effect whenever a blurred background is wished - to make the foreground subject stand out in the picture. The ISS is supposed to be at least 200 miles up in the sky. Show me a lens that can focus both the ISS and the Earth below it and I'll but it asap. I need it to snap a sharp picture of myself and the Space Station next time it passes over my house. Quite honestly, I wasn't expecting you to give me the old lens lesson treatment. Nice Japanese girl though. simonshack wrote: No. Telephoto lenses have very limited depth of field. Photographers use it for effect whenever a blurred background is wished - to make the foreground subject stand out in the picture. The ISS is supposed to be at least 200 miles up in the sky. Show me a lens that can focus both the ISS and the Earth below it and I'll but it asap. I need it to snap a sharp picture of myself and the Space Station next time it passes over my house. Quite honestly, I wasn't expecting you to give me the old lens lesson treatment. Well for me it is just not an "old lesson", Simon, nor a treatment of sorts, but a genuine question. I understand what you are saying: the ISS and the earth are too far from each other to be both in focus. So let's forget the telephoto. Here's a different approach, in all my ignorance: what if both the foreground and the background are included into the photographer's "infinity" range of focus...? (Hyperfocal distance, I understand it is called.) I guess in that case they would not look so close to each other? But couldn't that just be a result of the cropping of the picture? nonhocapito wrote: (...) what if both the foreground and the background are included into the photographer's "infinity" range of focus...? hoi.polloi wrote: What device is alleged to have taken the picture which was apparently even further from the Earth than the ISS? This would be a photo taken by a human, from an approaching (or distancing) vehicle like the soyuz or the shuttle. It "looks" as if being far away above the station. But it could also be intended as just above it (which would make the double focus even more impossible? ), and a bit in front as I seem to detect a bit of perspective? As you can see, this is a digital, artist's impression of the ISS - but the backdrop appears to be a standard aerial earth view from a passenger airplane. My point here being: why would a top, official NASA supplier of high-end camera systems choose to show artificial images of the ISS on their website? Wouldn't they - as optical experts - be particularly concerned with showing highly professional (and real) ISS photographic material? I'd almost forgotten about this - lol: the ultimate, most astronomically phony 9/11 "amateur" video of the highest order! "9/11 world trade center footage from space station"
There really is no end to this bullcrap. Or maybe there is: IF WE ALL START LAUGHING OUT LOUD ENOUGH! 9/11 HOAXERS - NASA HOAXERS - BANKER HOAXERS - GLOBAL WARMING HOAXERS - WAR ADDICTS - ETC... - all intimately intertwined?